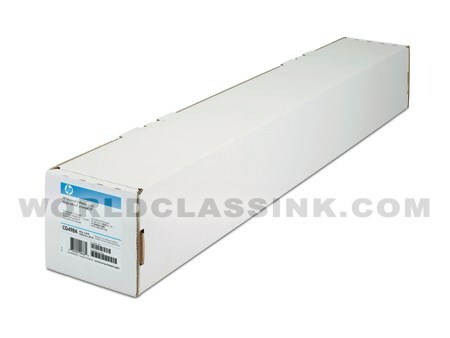 Colorfast pressure sensitive self-adhesive white vinyl. Thickness: 6.3 mil (w/o liner), 12.8 mil (with liner). Metric weight: 190 g/m² (w/o liner), 345 g/m² (with liner). Brightness: 92+ (w/o liner), 90+ (with liner). Each box contains (2) rolls. 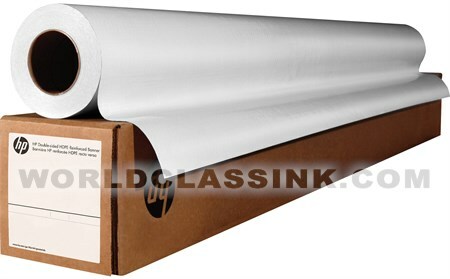 HP durable banner with DuPont Tyvek. Metric weight: 290 g/m² (with liner), 160 g/m² (without liner). Translucent bond matte inkjet paper. 36" wide x 150' long. 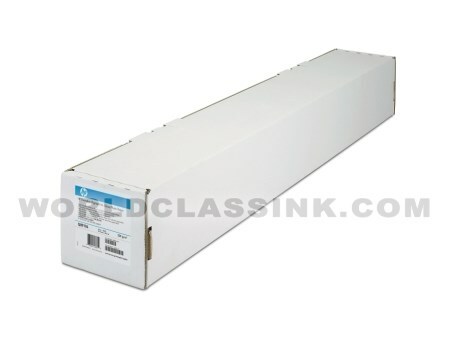 High Gloss photo paper roll. 36" wide x 100' long. Replaces discontinued part #'s: C6020A and C3877A. Semi-gloss CP photo paper roll. 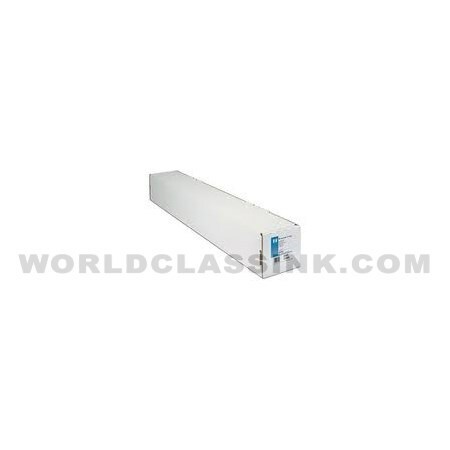 *This part # has been discontinued by HP and replaced by new HP part #: Q1427A. 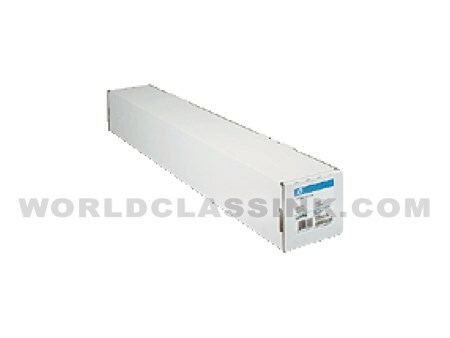 Replaces discontinued part #: C3879A and C6022B. 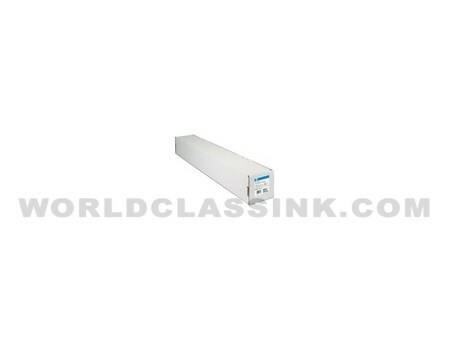 Bright white extra long paper roll. Durable banner film rolls with DuPont Tyvek. 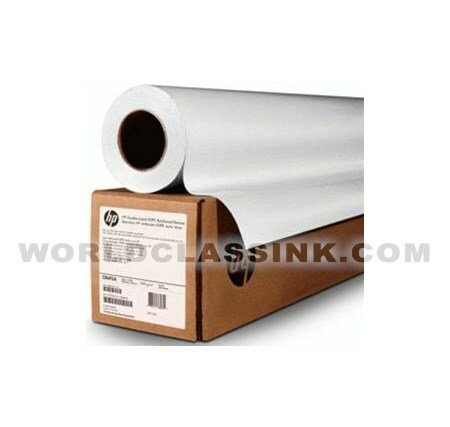 HDPE re-inforced banner paper roll for use with latex inks. Banner paper roll with DuPont Tyvek. 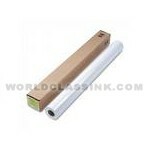 PVC-free, 100% polypropylene banner paper roll. 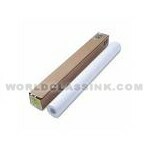 Everyday self-adhesive polypropylene film roll. Metric weight - 100 g/m². 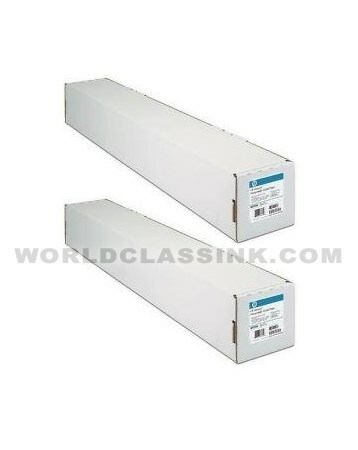 Everyday matte polypropylene film for latex ink printing. Permanent self-adhesive vinyl paper roll. Thickness: 4.8 mil (without liner). 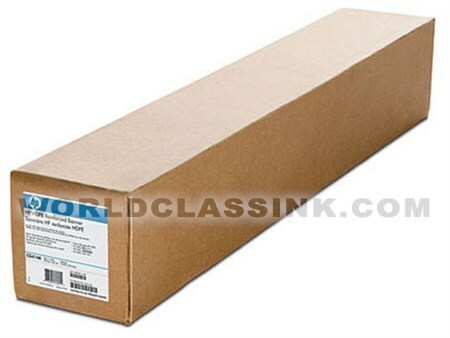 Metric weight: 150 g/m² (without liner). Replaces discontinued part #: C7921A. 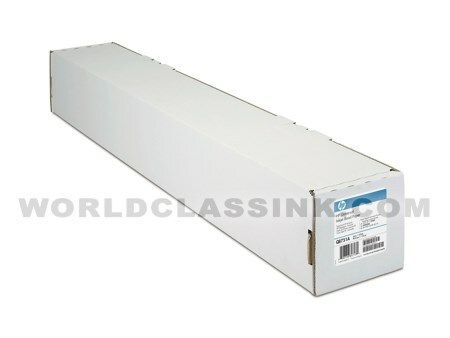 Universal heavyweight coated paper roll. Replaces discontinued part #: C7924A. 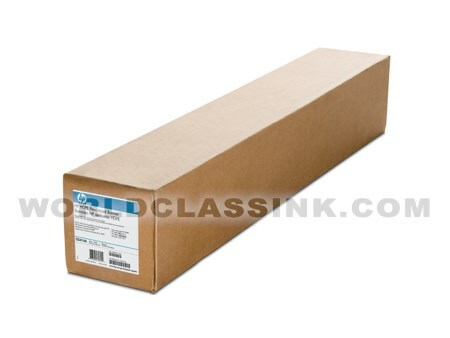 Replaces discontinued part #: C8311A. Universal high gloss photo paper. 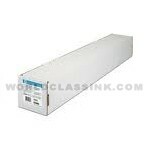 Replaces discontinued part #: C8316A. 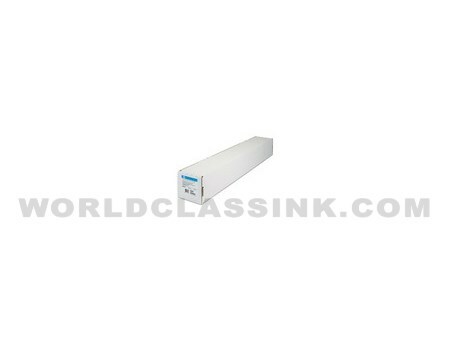 Heavyweight coated paper roll designed for outdoor use. 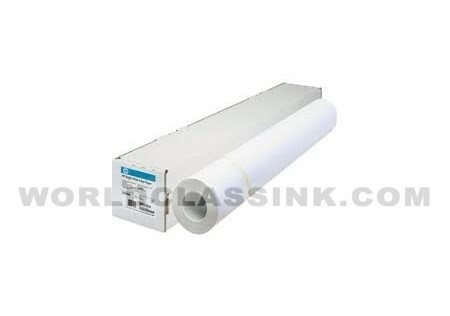 White polypropylene banner film roll. 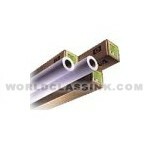 Polypropylene adhesive backed film roll. 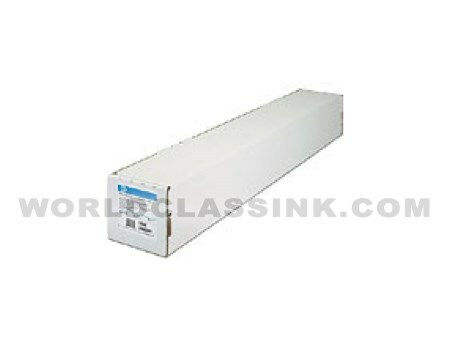 Waterfastness: if using dye-based inks, lamination is required. If using UV-based inks, lamination is not required. *Limited supply. 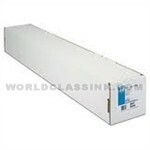 Please call or email to confirm stock before ordering if rush delivery is required. 36" x 100 foot roll. 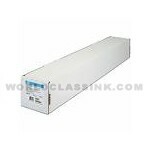 Metric page weight: 210 g/m². Universal instant-dry gloss photo paper. 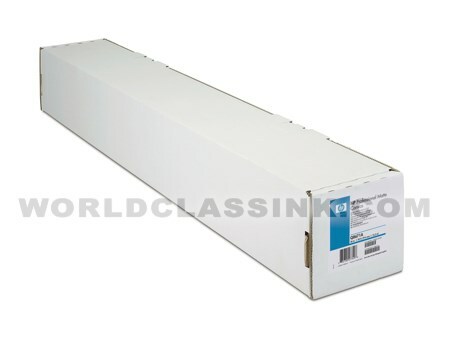 Universal instant-dry semi-gloss photo paper. Super heavy-weight plus paper roll. Super heavyweight plus matte paper. Outdoor billboard paper roll with blue backing. Premium instant-dry gloss photo paper. Premium instant-dry satin photo paper. Metric weight - 265 g/m². Metric weight - 240 g/m². 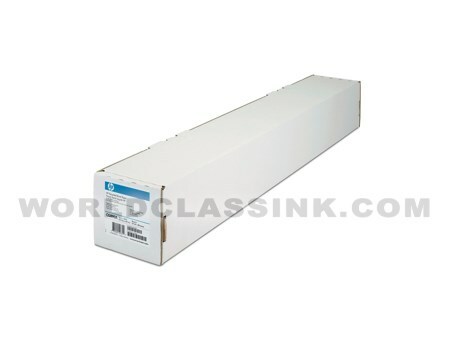 Note: HP has discontinued part #: Q8746A and we now substitute new HP part # Q7973A (Litho-Realistic Matte Finish). Premium vivid color backlit film. 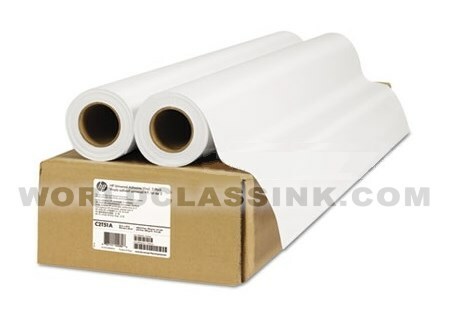 Glossy polypropylene self-adhesive film roll. Thickness: 7.8 mil (with liner), 5.5 mil (without liner). Metric weight: 176 g/m² (with liner), 120 g/m² (without liner). Everyday pigment ink gloss photo paper. Everyday pigment ink satin paper.